Explore la arena blanca de Doctor's Cave Beach, el legendario Margaritaville y pasee por el Hip-Strip para hacer algunas compras durante esta escapada de un día desde Montego Bay. Con su guía local podrá disfrutar de la calidez del sol sobre sus hombros y la arena de la playa bajo sus pies en la popular Doctor's Cave Beach. 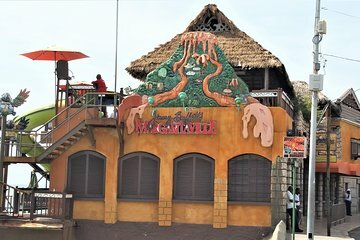 Diríjase a Margaritaville para disfrutar del entretenimiento y, a continuación, camine por las bulliciosas calles de tiendas para comprar algunos recuerdos. Se incluye el traslado de ida y vuelta desde hoteles de Montego Bay y Grand Palladium. Not as expected. Host friendly however the description is deceptive. Doctor’s Cave Beach was beautiful. For the price, this trip was great!!! You can catch a cab outside of your resort for about 5 USD and have them drop you off at Doctors Cove Beach. It costs 6 to get in to the beach included in the price of the tour, and 6 to rent a chair and another 6 to rent an umbrella not included in the price of the tour. From there, they tell you to walk from the beach to Margaritaville, as everything in between is the hip strip. They then pick you up from Margaritaville at a predetermined time. Then you could catch another cab for 5 back to your hotel note: Only pick the cabs that have red license plates. You can do this on your own far cheaper than booking this excursion! Being at Dr Cave Beach and Margaritaville was amazing.